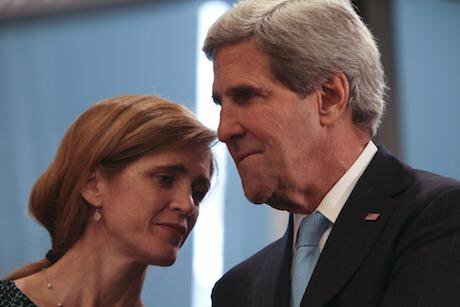 United States Ambassador to the United Nations Samantha Power and US Secretary of State John Kerry, September 2013. Allan Tannenbaum/Press Association. All rights reserved.On 18 August 2011, President Obama declared that “the future of Syria must be determined by its people”. But he immediately contravened this basic democratic principle by saying that Bashir al-Assad should cease to be President of Syria forthwith, irrespective of the wishes of the Syrian people. In a joint statement the same day, the UK, France and Germany dutifully agreed. At that point, regime change became the explicit policy of the US and its allies in Syria. This policy was maintained for nearly six years with a bit of wavering here and there about the timing of President Assad’s departure – until 30 March 2017, when it was overturned by President Trump's Ambassador to the UN, Nikki Haley. “You pick and choose your battles and when we're looking at this, it's about changing up priorities and our priority is no longer to sit there and focus on getting Assad out”. This new policy prioritised the defeat of ISIS over the removal of President Assad from power. As such, it reflected the position on Syria that President Trump had expressed on many occasions during his election campaign. This reversal of US policy was a staggering victory for President Assad. Thanks to assistance from Russia over the previous eighteen months, his military position had improved dramatically and the likelihood of him being ousted had diminished to near zero. Then, on 30 March 1017, his position was copper fastened by the US withdrawing its objective of removing him from power. Unlike Saddam Hussein and Muammar Gaddaffi before him, he had survived despite being targeted for regime change by the US and its allies. Five days later on 4 April 2017, if we are to believe the US, President Assad took the extraordinary decision to mount an aerial attack using chemical weapons against civilians in Khan Sheikhoun, a town held by the armed opposition in Idlib province, leading to the deaths of around 100 people including many women and children. Predictably, this brought down the wrath of the US and its allies on his head and on 6 April 2017, for the first time, the US took military action against the assets of the Syrian regime itself, firing 59 Tomahawk cruise missiles at the Shayrat air base from which, according to the US, the chemical weapons attack had been launched. President Assad is in a much weaker position now than he was before 4 April 2017, when he allegedly launched the chemical attack – his removal from power is back on the US agenda and there is now at least a possibility that the US will put its military weight behind overthrowing him. All this was the predictable outcome of President Assad allegedly deciding to launch a chemical weapons attack against civilians. He would have to be insane to take such a decision – and he is not insane. If you are trying to identify who is responsible for an act of this kind, it is common sense to ask who would gain from it. President Assad certainly could not have expected to gain and he hasn’t gained – he has lost, big time, and predictably so. The armed opposition has gained in that the US shift away from supporting their goal of regime change has been reversed. It remains to be seen whether the reversal is accompanied by direct military action by the US, or increased military support for the opposition by the US, in order to bring about regime change – if so, they will have gained, very big time. This document didn’t purport to be an assessment prepared by the US intelligence community and published by the US Director of National Intelligence. For a document that serves as a justification for unprecedented US military action against Syria, it is remarkably lacking in certainty in respect of its critical conclusions: it merely expresses “confidence” – rather than “high confidence” – that the Syrian government was responsible and merely says that the available information “indicates” that the chemical agent was delivered by air from Shayrat Airfield. As former CIA officer Philip Giraldi wrote on 24 April 2017, to date “no evidence has been produced to demonstrate convincingly that Syrian forces dropped a chemical bomb on a civilian area”. None of these uncertainties found their way into the mainstream media reporting of this US government assessment. Generally speaking they reported Assad’s guilt as a fact and failed to address the crucial question of why he deliberately shot himself in the foot. Why did Assad do it? This is a nonsensical claim because by 4 April 2017 when the alleged attack occurred, the opposition offensive had failed and Syrian government forces had recaptured all or almost all the territory taken over by the opposition in the early days of the offensive. Furthermore, Khan Shaykhun is north of the front line between government and opposition forces at the time, and it’s difficult to see how an attack there – especially a chemical attack with very little military value – could be a response to the offensive. But, laying that aside, what possible reason could there be for the Syrian government to use chemical – rather than conventional – weapons on any target anywhere, when their use was likely to provoke a military response, perhaps a devastating response, from the US? The use of chemical weapons at Khan Sheikhoun was the second occasion during the war in Syria when their use caused a large number of civilian deaths. The first occurred in the early morning of 21 August 2013, when a sarin gas attack took place in the Ghouta area of Damascus, resulting in the deaths of hundreds of people (355 according to Médecins Sans Frontières, 1429 according to the US government). On that occasion also, as we will see, the US administration asserted that the Syrian government was responsible for the attack on the basis of less than conclusive evidence, as later confirmed by President Obama himself. On that occasion also, the Syrian government denied responsibility. On 21 August 2013, a UN Mission was already present in Damascus to investigate allegations of earlier chemical weapons use. It was redirected by the UN Secretary General to investigate the Ghouta attack and it reported on 16 September 2013, that “the environmental, chemical and medical samples we have collected provide clear and convincing evidence that surface-to-surface rockets containing the nerve agent Sarin were used” in the attack. It was not part of the Mission’s terms of reference to identify who was responsible for firing the rockets. But the assessment contained no verifiable information to justify this conclusion. Nevertheless, at the time the mainstream media reported as a fact that the Syrian government was the guilty party – and they continue to do so today even though, as we will see, over time evidence to the contrary has steadily mounted. From then on, the expectation was that, if the Syrian government used chemical weapons against civilians or opposition forces, the US would take punitive military action against Syrian government assets in response. But, President Obama hesitated to take military action. One reason was the refusal of the UK Parliament to back an immediate US strike. 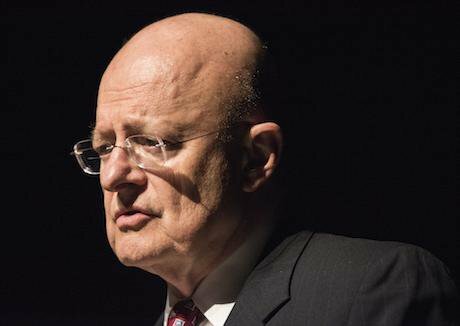 Another was that he had been warned by his Director of National Intelligence, James Clapper, that he couldn’t guarantee that the Syrian government was responsible for the chemical weapons attack. So, the certainty expressed publicly by the Obama administration that the Syrian government was responsible wasn’t justified. Were the sarin carrying rockets launched from government controlled territory? But, was the Syrian government responsible for the Ghouta attack? A key question here is: were the rockets which delivered the sarin launched from government controlled territory? An accompanying map on the Times’ front page showed the flight-path lines of the two rockets intersecting at a Syrian military complex, near the Presidential Palace in Damascus. This scenario required the rockets to have a range of at least 9.5 kilometres to travel from the postulated launch site in a Syrian military complex to the impact sites in Moadamiya and Zamalka/Ein Tarma. This HRW/NYT analysis received widespread publicity and was almost universally regarded as proving the Syrian government’s guilt. “The analytical flaws included the fact that one of the two missiles, the one landing in Moadamiya, south of Damascus had clipped a building during its descent making a precise calculation of its flight path impossible, plus the discovery that the Moadamiya missile contained no Sarin, making its use in the vectoring of two Sarin-laden rockets nonsensical. The new study referred to in the Times’ headline was by Theodore A Postol, Professor of Science, Technology, and National Security Policy at the Massachusetts Institute of Technology (MIT) and Richard M Lloyd, a former UN weapons inspector. They concluded that the rockets had a range of around two kilometres. This is in line with an estimate given by the head of the UN Mission, Dr Åke Sellström, at a press conference on 13 December 2013 (see video, around 16 minutes in), when he said: “two kilometres could be a fair guess”. “The U.S. intelligence community, supported by the remarkable capabilities of U.S. space-based infrared satellites, supposedly observed that the chemical rockets were launched from the heart of Syrian government-controlled areas, as shown on the map that the White House released. For this to be the case, the munitions would have had to fly about 10 to 15 kilometers, which is simply not possible. “Our analysis of the munition used in the attack on Zamalka reveals that the munition’s range is actually about two kilometers. The United Nations conducted a completely independent analysis of the munition and reached exactly the same conclusion. This indicates that the sarin carrying rockets could not have been fired “from regime-controlled areas” as asserted by John Kerry in his briefing on 30 August 2013. Most likely, they were fired from areas controlled by the armed opposition – and therefore fired by the armed opposition. Unfortunately, this crucial correction to the flawed analysis published by the Times a few months earlier got very little attention from the mainstream media, then or since. Was the armed opposition capable of mounting the Ghouta attack? “The regime possesses sarin, and we have no evidence that the opposition possesses sarin." Seymour Hersh is an investigate journalist with a legendary reputation dating back to his exposure of the My Lai massacre during the Vietnam War and including his revelations about the torture and other abuse of prisoners at Abu Ghraib during the US occupation of Iraq forty years later. He has written two extensive articles on the Ghouta attack, which were published in the London Review of Books. He claims that in August 2013 the Obama administration had ample evidence that elements of the armed opposition were working with sarin. “by late May 2013 … the CIA had briefed the Obama administration on al-Nusra and its work with sarin, and had sent alarming reports that another Sunni fundamentalist group active in Syria, al-Qaida in Iraq (AQI) [later Islamic State], also understood the science of producing sarin”. This confirmed that “al-Nusra had the ability to acquire and use sarin”. The only source Hersh gives for this information is “a senior intelligence consultant”, but given his formidable record as a journalist what he writes deserves to be taken seriously. I’m not in a position to verify this account of how the Ghouta attack came about. But, given Erdoğan’s enthusiasm for overthrowing Assad, it certainly made sense for the Turkish state to help manufacture a “false flag” chemical weapons attack to which, given his foolish setting of a red line, Obama would almost certainly have to respond by taking military action against Syrian state assets. It made absolutely no sense for President Assad, when he was in the ascendant militarily, to take a decision to mount such an attack himself, in the full knowledge that Obama would almost certainly respond militarily – which could have led to victory for the armed opposition and his own removal from power. He would have to have been suicidal to engage in such a provocation. “Why was chemical attack of any interest for the Assad regime, given the fact that in recent months they’ve been making advances rather than retreating? And why would Assad – by all account such an extremely unpleasant regime, but it’s not irrational – why would he decide to risk the wrath of US when he was making progress in any event?" In August 2013 the Obama administration declared with “high confidence” that Assad was responsible for the Ghouta attack even though the available intelligence to that effect wasn’t a “slam dunk” (unlike the US intelligence that Saddam Hussein possessed “weapons of mass destruction”). Today the Trump administration declares that it is merely “confident” that Assad is guilty of the Khan Sheikhoun attack – which presumably means that the available intelligence is not a “slam dunk” either. Sean Spicer should be asked to clarify.